We live in a world that operates on bits and bytes; a merging of the material and the immaterial. Our configurations of physical objects all have a layer of technology embedded in them, creating a potential for everything to sense, record and communicate. What if humble objects of the everyday become determined to counteract our intentions and behave in unexpected ways? This is a speculative design fiction demonstrating what it might be like to experience an alternative future scenario where objects have agency. It addresses the ontological and sociological aspects of them living in symbiosis with humans and having profound behavioral impacts on them but most importantly their affect on the context these objects live in. Delirious Things is a design fiction and a playful interpretation of these concepts in the form of a kinetic network of objects. It is a critique on smart objects and their interfaces expressed in the mechanics of these objects. They are absurd in their essence at the instance they are perceived and aim to convert an existing form conventionally associated with their use that responds to the absent and the paradoxical. The goal of this thesis is to raise questions rather than pose answers. It is a speculative peek into the near future; but that is not the main purpose of such a project. The prototypes should be understood as conversation pieces that expose some of the hidden assumptions of the new technology of interconnected things and the way it is appropriated in social technical situations, while presenting alternative trajectories to the ideas of “smart” objects. We generally think of smart objects as masters of efficiency, accomplishing the missions as quickly as possible. A Rube Goldberg machine would turn this notion upside down (slide it and shoot it into the air…) creating a very sophisticated chain of actions in order to accomplish a very mundane task. On the other hand, project will not give definite answers. Natural Fuse wonderfully illustrates the problem of the disaster of the commons, and tests our ideas about the capability of a networked urban commons. However it does not provide with direct solutions or answers. The objects or units in this project will operate as mediators that play an active role in the constitution of norms and values. So the goal is not to give an empathetic lead about where the Internet of Things is taking us in the future but to succeed in bringing up important questions that divert the discussion from the technological determinism to an open ended affair that becomes not only the concern of designers, architects, engineers but for all of us. European playwrights in the 1950s expressed what happens when human existence has no meaning or purpose and therefore all communication breaks down, alerting their audiences to pursue the opposite. The “Théatre de l’Absure” involved characters that are stuck in the routine daily life like automatons. They resort to nonsense language and clichés when words appear to have lost their original function, therefor creating misunderstanding among the characters. This project originated with inanimate objects living in a world of forces and gave those objects desires, autonomy, and the ability to take action. According to a system of rules, these units will live in their environment and evolve over time. Now I ask: What is each unit’s decision-making process and how can it adjust its choices by learning over time? How will the network be affected and what unexpected results can occur? What happens if the Internet of Things becomes a theatre of the absurd rather than a conventional smart environment? The Internet of Things defines a world rooted in so many digital devices that the space between them does not consist of dark circuitry anymore but rather the space of the environment and the city itself. This potential I find in ordinary objects today seems to finally fulfill my dream of experimenting with a cybernetic apparatus for modeling space. Along with my underlying interest in notions of time and space and cinematic architecture, the works of architects such as Archigram, Christopher Alexander and Cedric Price who were on the threshold of designing an architecture that has become information fascinate me. 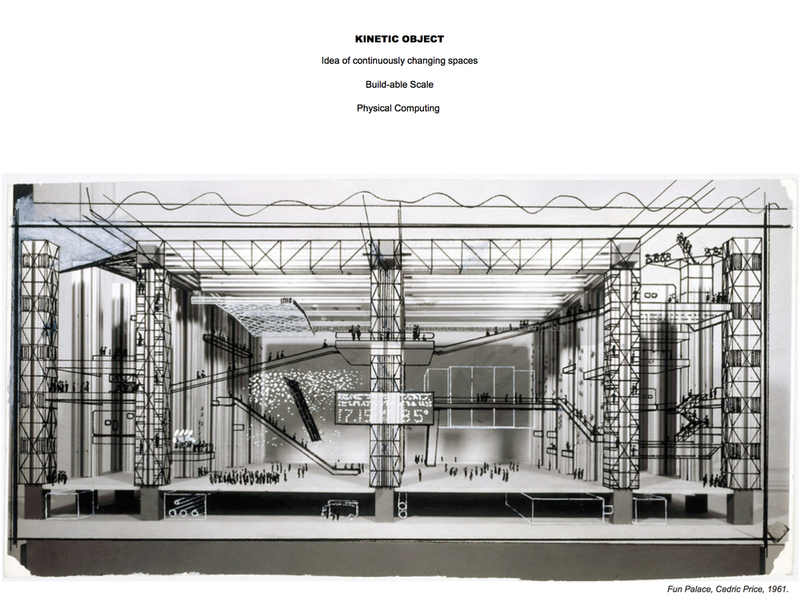 Cedric Price combined networks and infrastructure to design building details, games and toys as strategies of human and non-human actors unfolding the construction of space over time. I strongly believe we are not yet accustomed to the idea that the inanimate could possess agency as much as we are not fully aware that they carry information unless we know they are programmed with code to do so and are designed by protocols of information technology. But as it is hard to see spatial technologies and networks independent of the digital, I look at examples of existing systems such as traffic lights and electrical grids. The agency seems to be clear in relationship to the objects that form these networks - in these cases, the cars and the electrical voltage - but not vis-à-vis the network itself, which seem relatively static to us at first glance. As a matter of fact, the spaces we occupy are arrangements of objects, but this organization of objects could be active by itself. The agency is then present in the networks and those can become active and therefore influence the context in which they exist. In my research, I am bringing the notions of Object Oriented Ontology and the Internet of Things together in order to address a speculative future where networks affect our interaction with the objects, the way we design them and the way we organize them in context. Object Oriented Ontology as addressed by Ian Bogost in his book Alien Phenomenology or What it’s like to be a thing, questions the characterization of being. It puts all things within networks of relations. But it also raises problems where “interactions sit outside rather than within the being of a thing”. In the context of Bogost’s theories, the word network suggests predefinition or in other terms pre-programming. I found that it was important for me at this stage in my research process to understand theory of flat ontology – which “refuses distinction and welcomes all into the temple of being” in order to contextualize my project. The systems I will be working with are comprised of units that are held together by operations that underlie how these units behave and interact. As Bogost explains, there is a potential in the theory of unit operation if we consider the simple fact that units operate. “That is, things constantly machinate within themselves and mesh with one another, acting and reacting to properties and states while still keeping something secret”. My goal is to write the speculative fictions of their processes and their unit operations, but also to prototype and create in the areas where all these OOO philosophers have gone before but where few artists have bothered to linger. I would like my thesis project to be a practice of this alien phenomenology. Flat ontology is the theory in which all things are equally things. Roy Bhaskar used this term pejoratively to refer to anti-realist philosophies that flatten everything onto an epistemic plane of human access, Manuel DeLanda (an admirer of Bhaskar) reversed it into the positive principle that all realities are equally realities. Similar notions can be found in the “absistence” of Alexius Meinong, the “irreduction” of Bruno Latour, and my own critique of the undermining/overmining pair. Also noteworthy is Levi Bryant’s use of the term “flat ontology” throughout The Democracy of Objects and his earlier essay “The Ontic Principle.”16 For Tristan Garcia, flatness is only one face of the cosmos, and one that he ultimately declares to be rather impoverished. – Object-Oriented France: The Philosophy of Tristan Garcia by Graham Harman. A series of essays and projects that comprise the Sentient City by Mark Shepard provide concrete examples around the argument that citizens can play as designers and participants in the unfolding techno-social situations of near future urban environments. One of the commissions that inspired me in my thinking on ubiquitous networks is “Natural Fuse”: a network of plants that will only allow a limited amount of energy to be expended depending on the amount of carbon dioxide that can be taken in by the plants that are growing in the system. They act as a natural break in the system, the same way an automatically operated switch would in an electrical circuit. What happens in the interaction with the users is that they are more engaged to cooperate on energy expenditure in order for the plants to blossom because if they don’t, the network starts to kill plants, which would diminish the network’s electricity capacity (who wants that?). So far, this project seems to be about a system of interaction where the solution to the problem is obvious. What is interesting for me in this system is the Catch-22 situation: there is not really a direct solution to the problem. The following questions were raised in the development of this project: What if the amount of carbon that a single houseplant can sink is much smaller than expected? What would you do? Use less energy? Or supersize the fuse? You might need 420 plants to offset your 50W lightbulb! And if a plant dies any carbon isolated during the growth period is eventually released back into the atmosphere. A zero-sum situation depends entirely on where the arbitrary boundaries of the system are drawn. What would you do with your plant? Eat it? Bury it? Weave it? I want to imagine future interactions with objects be it in private or public contexts that trigger a debate of what kind of future cities or homes we might want. In this domain of design fiction, I want to take a leap of my imagination and believe that these technologies are going to have a great impact on us and on the cities as we know them today, re-shaping the urban fabrics and transforming our homes, the built environment and how we exist in them. The third prototype explores the networks aspect of the project. It is a visual exploration programmed with code, inspired by the idea of brain function and neural networks. One of the key elements of a neural network is its ability to learn. This prototype is meant to explore the adaptive aspect of the objects with agency, meaning the change in its internal structure based on the information flowing through it and the networks these object create. It is based on Daniel Schiffman’s Chapter 12: Neural Networks from his book “The Nature of Code”. The objects in this sketch are the neurons, useless by themselves but the network is the brain. Delirious Things is comprised of neurons and the network/installation is the brain. The question that remains open in the context of this project: How many meaningless interactions add up to create one meaningful event? We live in a world that operates on bits and bytes; a merging of the material and the immaterial. Our fundamental configurations of physical space all have a layer of technology embedded in them, creating a potential for everything to sense, record and communicate. I aim to investigate the ways in which hidden systems can manifest in our daily lives, if these systems counteract our intentions and behave in unexpected ways. A button being pushed exemplifies our ability to control the material, but the underlying mechanism has a life of it’s own. This is a speculative project demonstrating what it might be like to experience a future where design objects have agency. The occasional prank might be fun and unexpected, but the sociological impacts of objects living in symbiosis with humans might have profound behavioral impacts and most importantly will affect the context these objects live in. Speculative design is open to several interpretations, but how is the fictional character of such work conceptualized and produced? On one hand, the purpose of this thesis is to enable us to think about the future of the objects interaction in the realm of the Internet of things. On the other hand, it is a critique of the current and contemporary situation. A key concept is the perceptual bridge, the methods by which designs engage their audience. The design of the system of interaction between these objects require a bridge to exist between the audience’s perception of their world now and the ‘fictional’ element of the concept: objects with a certain agency communicating information with each other in unexpected and ‘smarter’ ways. By starting to think about audience, I believe that it is interesting for me to explore the notion of audience from a situationist point of view to be more consistent with the concept and questions I am asking; by putting the objects as the main subjects within the system, the audience becomes the objects themselves and the ‘real’ audience would be in that case defined as a spectator. I am looking at several existing systems (handshake in computers, beacons, the internet…) that can work as a blueprint of the scenario where multiple everyday objects communicate, following a specific protocol that will direct the choice of these objects, the technology imbedded in them and their context. I am also looking at these objects as characters in movie scenario, building up on their potential to become actors creating relationships between each other, going deeper in the attributes, personality in the realm of affective computing. As for the prototyping process I would create 2-3 simple prototypes that elaborate or exemplify on what goes on in this world. I may choose to create a film from them, and that could work well in framing the ordinary everyday context and further elaborate on the psychological aspect and the user scenario. So the question becomes about the nature of the network and the choice of the daily objects at this point. I will push my research towards looking at the rule sets of existing systems to guide the making of the system that these objects live in. The Internet as a system is interesting to look at since it is about the addition of points to a network where everything is connected and you just add to it. I am also looking at protocols and parsing systems principles. The aim of these prototypes is to find a set of rules that can govern the exchange or transmission of information between the objects, their agency and more importantly their relationship to the context I will describe. - Is the ‘algorithm’ a commentary on Surveillance? By bringing in the notion of surveillance, we start to think about the communication of data that these objects have the potential to produce and perhaps make public. - In the mundanity of everyday objects, is the uselessness of these objects given meaning through the data If something that is meaningless triggers something equally meaningless, where does it gain meaning? Melanie Crean’s feedback was focused on “studying the relation objects have to context”. Which makes more sense than “the space around objects,” which mostly sounds like physical space, though it is meant literally, physically, and metaphorically. However, this is still a general question. So her questions were: What are you studying about that context? Which objects, where? that this will only further their service to us, it is important to point out how they might subvert our assumptions, be transgressive, go awry, take on agency for their own purposes etc. So Melanie’s central critique is that I should now think in more detail about different possibilities that abhorrent or transgressive agency might take, and possible ramifications. What would design noir be in reference to the Internet of things? If objects work together, what rights might they demand that differ from humans (maybe in terms of workers rights, work place equality, etc). Might they try to contribute to human politics and economy, or form their own subsets? Would they break any laws, or engage in organized crime? Or would they try to reform humans, and ironically make us more accountable for all the things we do? Also, my statements and questions are still too general, good as a starting point, but need to describe the context much more specifically for the thesis to have meaning and be interesting. “If our infrastructure goes beyond sensing and detecting, how can we ensure the objects are affecting network the way we want?” can be reframed to go beyond it. It is true that we can ensure that and that they will do what we want, but it wouldn’t be as interesting as to explore hypothetical options of crazy things that might happen if / when they do their own thing. I am interested in studying this invisible data around us; the space surrounding the objects we design, in order to understand the aesthetic and functional components of these objects in relationship to their context. I am questioning how we perceive reality today and what it means to be human on the threshold of human-machine interaction in order to reveal the tension between the animated, the inert and the networks they are creating. I have come to a point in my research where my exploration connects two fields: one emerging in the design of future objects and the other in their networks. I want to imagine future interactions with objects be it in private or public contexts that trigger a debate of what kind of future cities or homes we might want. In this domain of design fiction, I want to take a leap of my imagination and believe that these technologies are going to have a great impact on us and on the cities as we know them today, re-shaping the urban fabrics and transforming our homes, the built environment and how we exist in them. I am now less concerned with projecting near or far dystopian scenarios of urban conditions and more excited to provide concrete present examples around which to organize a kind of future we want. This also opens a window on how to create a language that represents these future landscapes. 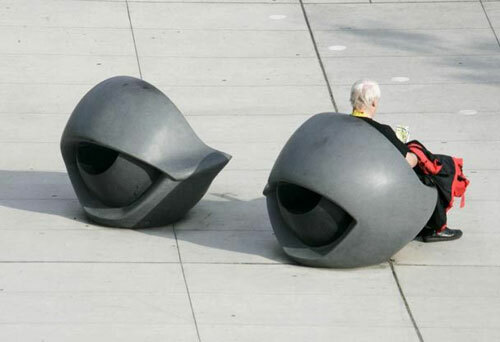 To illustrate the concept idea, I selected two examples of urban furniture that point out in two different ways the idea of awareness of the space that surrounds an object. 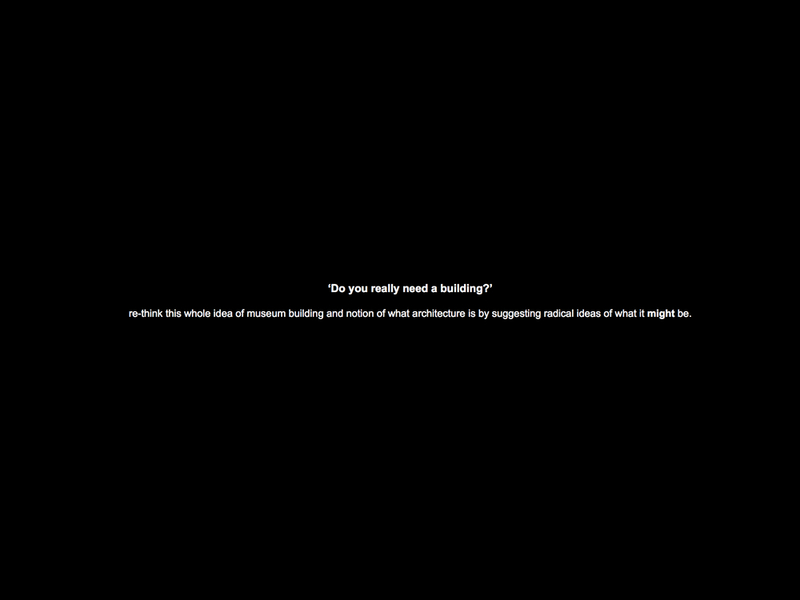 In 2011, my architecture thesis put forward the hypothesis that there is a potential in the idea of absence in Architecture: there is something of value in building, to see the essence of what is not there. So the main question became finding a methodology to explore this phenomenon of absence. I investigated the areas of cinematic architecture, dematerialization and objects in the city as a process and built a strategy for intervention upon that in order to design the project. My current thesis project redefines the idea of architects shaping the built environment and questions the profession of architecture in relationship to the technological development of ‘smart’ objects and their networks, within a home or in a more general and public environment. The essays and projects that comprise the Sentient City provide concrete examples around the argument that citizens can play as designers and participants in the unfolding techno-social situations of near future urban environments. The notions and ideas presented in this exhibition brought me back to look more in depth at Archigram’s and Superstudio’s works Living Cities and Continuous moments, where events and situations create networks that are far more important in the shaping of the urban environment than the material demarcation of space. My interest in the object is not necessarily a sign for emancipation of the object but rather an interest in turning the subject to the object for lessons on lifestyle, social behavior and our relationship with the environment. If our infrastructure of everyday artifacts was to become capable of sensing and perceiving what it is detecting, how can we make sure the response is shaping the networks of our environments the way we want? I believe that we are far from being in a world shaped by the Internet of things so I am focusing my research now on the behavior of objects within a concise context as a starting point; looking at networks between these objects and the chains of data they create. The purpose is to envision a future that is shaped by the emerging culture of interconnected things. I am interested in revealing new levels of perception to an invisible layer of our nowadays objects. The focus is not on representing the reality of this invisible layer, but on the making of a critical proposal with the question: While enhancing, optimizing and improving, is there a possibility to explore other approaches, perhaps less useful but as meaningful; more poetic, humoristic and situationist? Amphibious Architecture :: Network of floating tubes at Pier 35 in the East River. By creating a confusing system, the machine is over designed and engineered in the most complex way to perform a very simple task in the most complicated way. The system is a chain reaction: a sequence of reactions where a reactive product or by-product causes additional reactions to take place. In a chain reaction, positive feedback leads to a self-amplifying chain of events.